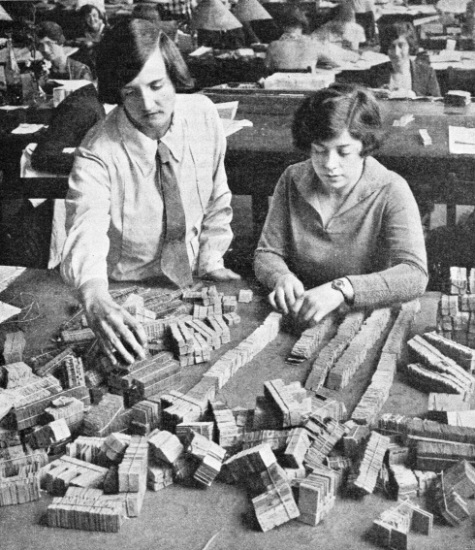 SORTING TICKETS in the Railway Clearing House is carried out by a large staff of highly skilled employees. The function of the Railway Clearing House is to clear or to apportion the receipts of the through traffic of Great Britain’s railways and of certain Irish lines and ports. Some 23,000 miles of rail routes come under the scope of the Railway Clearing House system. A PROSPECTIVE passenger can walk into any station booking-office in Great Britain and purchase a ticket for practically any other station in the country - and that ticket will take him right through to his destination, irrespective of the ownership of the lines over which he may have to travel. The traveller may buy a ticket at Dover, on the Southern Railway, for - say, Oban, served by the LMS. How is the ticket money shared? Again, a train of goods wagons on any line will often bear the initials of all the railway companies - GWR, LMS, LNER, SR. How is carriage paid for on the goods in these wagons - running as they do over the lines of other companies? In both instances settlement is made through the Railway Clearing House. The story of the RCH, as it is usually known, goes back to the very early days of railway operation. At first there was no provision for through booking by passengers. It was not possible to send goods throughout the journey in the same wagon. The travelling public soon began to demand the convenience of through booking. Merchants, too, dissatisfied with the loss and delay occasioned by transhipping goods from one company’s wagons to those of another, agitated for a system of through-invoicing for goods traffic. The railways were forced to give facilities to meet the general demand, but for a time the difficulties of settlement between the various companies were a bar to progress. It is uncertain whether the credit for the idea of a central office to deal with the settlement of through accounts is due to Mr. George Carr Glyn (afterwards Lord Wolverton), chairman; to Mr. Robert Stephenson (son of George Stephenson), engineer; to Mr. Kenneth Morison, chief of audit department, all of the London and Birmingham Railway, or to Sir James Allport of the Midland Railway. Mr. Glyn, however, the banker, who was, of course, familiar with the methods of the historic Bankers’ Clearing House for the settlement of financial transactions, without doubt wholeheartedly supported the idea. The Railway Clearing House was accordingly established on January 2, 1842. From that date travelling facilities began to expand. A staff of four men formed the nucleus of the Clearing House, which was situated in Drummond Street, opposite the present main entrance to Euston Station, a London terminus of the LMS. 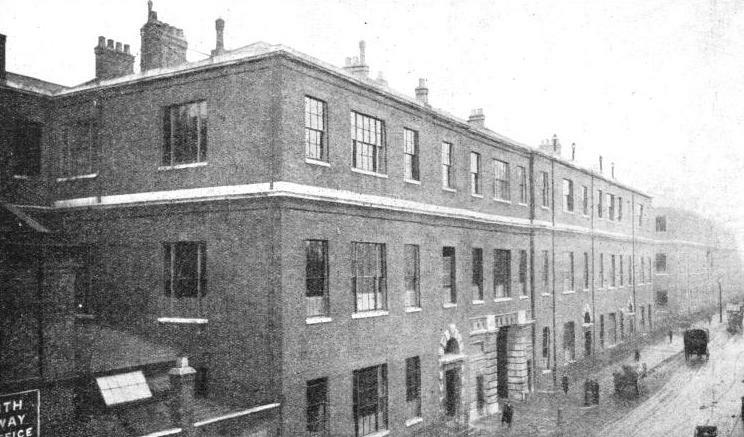 Business was carried on at Drummond Street until 1848, when the first block of the present building in Seymour Street, Euston Square, was built. The first secretary of the Clearing House was Mr. Kenneth Morison. Nine railway companies were admitted to participate in the business. They were the London and Birmingham, Midland Counties, Birmingham and Derby Junction, North Midland, Hull and Selby, Manchester and Leeds, Leeds and Selby, York and North Midland, and Great North of England. These companies have long since been merged in the constituent companies of the LMS or LNER. OLD DOCUMENTS are stored in the muniment room of the Railway Clearing House, seen in the above picture. 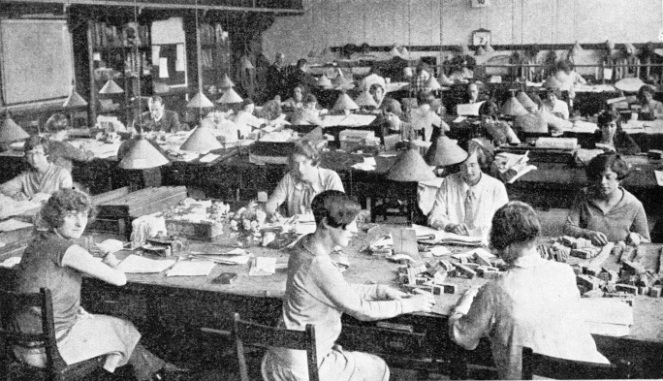 The Railway Clearing House is divided into three main departments - the Secretarial, the Merchandise, and the Coaching sections. The traffic receipts handled by the original Clearing House were those for the through conveyance of goods, passengers, parcels and live stock between London and Darlington in one direction and between Manchester and Hull in the other. The railways included in the RCH system had increased by 1845 to sixteen, with 656 route-miles of track. The difficulties of obtaining cash settlement between the railway companies and the clearing house, led in 1850 to the passing of an Act of Parliament conferring on the RCH the right to sue in the courts. This ended the trouble and the companies subsequently settled all payments promptly. The Railway Clearing House was Incorporated by Act of Parliament in 1897. From its beginning it had been under the control of a Committee consisting of one delegate from each of the companies under the system. Changes were made, however, under the Railway Clearing House Amalgamation Scheme of 1922. The corporation now consists of four delegates from each of the four great amalgamated companies and one from each of the other companies, namely the London Passenger Transport Board, Mersey Railway, the lines of the Joint Committees, and the Irish Companies. An executive or “Superintending Committee” of eight members is elected from the delegates of the corporation. The number of companies working under the RCH system to-day is fifteen, with a total route length of 23,000 miles - a figure in striking contrast to the 656 miles of 1845. The receipts of the Clearing House for 1842 were £193,246; for 1933 the amount involved was over £34,000,000, an equally striking comparison. The work of the Railway Clearing House is divided into three Departments - Merchandise, Coaching, and Secretarial. The Merchandise Department apportions the receipts from the carriage of goods, minerals, and livestock. Coal traffic was formerly settled through the Clearing House, but adjustments are now made by the originating Company, which collects the charges and pays out the other companies' proportions. The first function of the Railway Clearing System is to ensure that charges in which two or more companies are concerned are correctly accounted for at both terminal stations, from which the respective agents send information each month to the Clearing House. Any differences between the two sets of accounts are then settled by correspondence through the Audit offices. Perhaps the best means of understanding the system will be to consider, for example, a consignment of goods from Bristol (LMS) to Southampton (Southern) via The Somerset and Dorset Joint (between Bath and Templecombe). We will assume that the load weighs 10 tons and the charge is £10, of which half is “paid” at Bristol and the other half “to be paid” at Southampton. On making a settlement there are three companies to share in the receipt of £10 - the LMS (Bristol to Bath), the Somerset and Dorset Joint (Bath to Templecombe), and the Southern Railway (Templecombe to Southampton). The first adjustment to be made on the accounts is that relative to what are known as “terminal services”, such as collection and delivery charges. The balance of the total charges is usually divided on a mileage basis, according to the distance the load is carried over each of the railways. There are, however, a number of exceptions to this principle, such as agreed apportionments, fixed tolls on tonnage, and other special methods of division. This leaves a residue from £10 of £7 13s 4d, which is divided on a mileage basis, taking the total distance at 100 miles - 10 miles on the LMS, 30 miles on the Somerset and Dorset Joint, and 60 miles on the Southern Railway. If there had been traffic in the reverse direction, the two entries would have been combined in one settlement to cover both “up” and “down” traffic. To minimize the clerical work involved, it is now the practice to limit individual division to the larger monthly sums, and to make a bulk settlement of the smaller monthly amounts. In practice, the larger amounts are not divided in detail until the close of the half years ended June and December. Each month “interim” accounts are brought out and payments made “on account” to the companies concerned, subject to adjustment at the half-yearly settlement. The bulk settlement of small amounts is made on a basis of total receipts per pair of companies, irrespective of route. After a percentage deduction for terminal charges, the remainder is divided half-yearly, on an agreed formula. This is done to avoid many separate calculations. Since in each half year there are as many as three million transactions, three-fourths of are which “small”, the saving of work will be obvious. Passenger traffic is dealt with through the Railway Clearing House on different lines, and is divided by its Coaching Depart-ment into two main categories - a “two companies” group and a “three companies” group. Under each of these heads, ordinary (including monthly and tourist tickets) and excursion bookings are dealt with separately. With “two companies” traffic, where only two railway systems are interested, the booking company shows particulars on its returns of the booking and also of the other company’s proportion of the receipts. This proportion is then credited by the Clearing House to the company to which it is due and entered as a debit against the booking company. The booking company’s returns are then sent forward to the non-booking companies for agreement or any necessary adjustment. “Three companies” passenger traffic is similarly returned by the booking company, but the other companies’ proportions are not shown. The apportionment is made by the RCH in accordance with a method agreed between the companies con-cerned. The booking company, since it is in possession of the cash, retains its proportion of the total receipts and the RCH deals only with the proportions of the non-booking companies. THE EXTERIOR of the Railway Clearing House building in Seymour Street, London. The first block of the building shown above was built in 1848. The Railway Clearing House itself was established in 1842, and later incorporated by Acts of Parliament in 1850 and 1897. To consider an example, suppose £100 worth of passenger traffic is booked by the LMS, of which £30 is due for division among other companies. The latter, however, may owe the LMS, say, £50 in respect of their own bookings. The result will be, therefore, a credit of £20, which is paid to the LMS by the Clearing House. Where the receipts are 60s or under from one station to another (over one route) in a month, they are dealt with by what is known as a “light fund” arrangement. The light fund is apportioned in ratio to an actual division of similar traffic receipts in tour selected months prior to the month of settlement. The traffic returns of the booking companies are checked by the RCH by means of the tickets collected at the end of the journey. The tickets are sent to the Clearing House each month, where they are sorted into booking-company so as to facilitate comparison with the returns. This check efficiently safeguards the interests of the non-booking companies. Parcel traffic is another important branch of Clearing House work. The present system of forwarding parcels was introduced in 1917, and involves the use of adhesive stamps affixed by the forwarding station agent, to cover the conveyance charges. Details of each parcel dispatched, and of the value of the stamps affixed are entered in a counter book, the receipts forming part of what is known as a “parcel pool”. The parcel pool is divided each month on an agreed basis, the apportionment being based on the receipts and number of parcels carried respectively in the years 1928, 1929 and 1930 (taken as a standard) and the number of parcels carried in the current month. Before the passing of the Post Office (Parcels) Act of 1882 the railway companies had practically the monopoly of parcel traffic. Although the Postmaster-General was prepared to accept parcels from the public, he was dependent mainly on the railways for conveyance. It was enacted that the PMG should pay the Railway Clearing House, each quarter, an agreed percentage of gross receipts collected by the Post Office in respect of parcels carried by rail. Over ninety per cent of the Post Office parcels are carried by the railways. TRAFFIC RETURNS of the different railway companies are checked by the Railway Clearing House. The tickets surrendered to the collectors at the end of journeys are despatched to the Clearing House each month. This illustration shows how they are sorted into order so that the returns may be checked. The Post Office accounts to the RCH by taking a count of all parcels delivered at every post office throughout the kingdom, and for one week in each quarter a detailed list is prepared showing postage of every parcel posted, and whether conveyed by rail or road. The average postage per parcel and the percentage of rail and road-borne parcels form the basis on which the railway companies receive their remuneration from the Post Office. Another function of the RCH is operation of the “Bulk Travel” arrangement, which, by the issue of vouchers, enables traders and their employees to travel on business between any two stations in the United Kingdom at special rates. The trader must have incurred at least £300 in freight charges during the year before an application is made, and a minimum distance of 10,000 miles must be travelled within twelve months. A commercial firm participating in the scheme deposits a sum of money with the RCH, and is then issued with books of vouchers. These are filled in as necessary and presented at the railway booking offices to obtain tickets, for which no payment is made at the time. There are now 3,000 firms for whom ledger accounts under the scheme are kept at the Clearing House, and monthly statements are rendered to them showing the balance standing to their credit. We have seen how goods and passenger traffic are handled respectively through the Merchandise and Coaching depart-ments of the Clearing House. The third department is the Secretarial. This is sub-divided into two sections, the “Mileage” and “General”. The work of the Mileage Section is again sub-divided into three further sections, which deal respectively with charges of “mileage” and “demurrage” on coaching stock, the “balancing” of wagons under the “common user” system, and the apportionment of charges under the “journey payment” scheme. “Mileage” is a charge payable to a company for the loan of its coaching stock to other companies where “through” coaches or trains are run. The mileage charge is fixed by a tariff, and involves an obligation on the receiving company to return the stock within certain periods and by appropriate routes, subject to a penalty known as the “demurrage” charge. Mileage and demurrage accounts relating to coaching stock are based mainly on weekly returns from all junctions where stock is exchanged, and from station returns of arrival and departure of foreign stock. Mileage and demurrage charges were at one time raised on wagons, and their covering sheets or tarpaulins. Wagons at the end of a journey were unloaded and sent back empty to the forwarding company - thus causing an enormous amount of unnecessary haulage. A company would frequently return empty wagons to another company at a junction and at the same time receive from that company its own empty wagons. Conditions arising out of the war of 1914-18 brought about one of the most important changes in the history of the RCH. The immediate use of all stock was necessary, and wagons and sheets were urgently needed overseas for the use of the British and allied armies. In January, 1917, the “common user” system was inaugurated for all railway companies’ wagons in Great Britain, although such an arrangement had been in operation previously between certain of the larger companies. Under “common user”, with certain exceptions, all wagons up to a carrying capacity of twelve tons are regarded as common property; and a company may load into any wagon, irrespective of ownership, which may be standing empty. Similarly, the load may be covered by any sheet. A trader also may use any railway company’s wagon that has delivered goods into his siding or works for an outward load if required. To ensure that companies benefit equally under the “common user” scheme, the movements of all wagons passing from one railway system to another are recorded at exchange junctions and forwarded to the RCH. By means of these returns it is possible to ascertain the number of vehicles received or forwarded in excess of the exchanges, which have to be repaid in empty stock. Settlements are made by the Clearing House every three days, and the companies concerned are called upon to transfer the empty wagons accordingly. The “common user” arrangement made it difficult to apply mileage charges to stock under that system, so a “journey payment” scheme was inaugurated, whereby a fixed payment per wagon per journey is made in respect of all loaded wagons exchanged between the different companies. The scheme does not cover coal or mixed traffic, but it covers stock of over twelve tons capacity. Apportionments of the “journey payment” receipts are made by the Clearing House every six months. 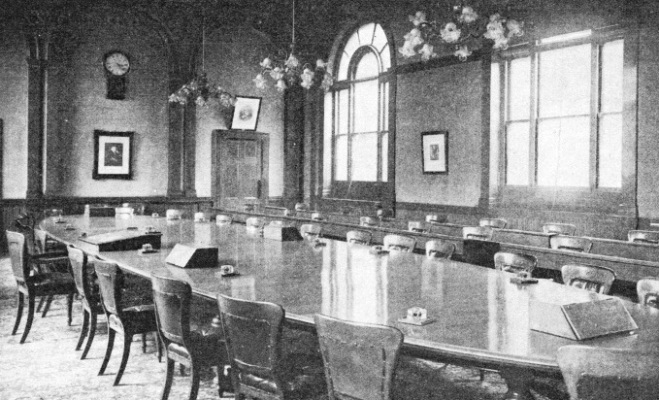 THE BOARD-ROOM of the Railway Clearing House. The organization is controlled by a committee comprising four representatives from the board of each of the main British companies and one from each of the other companies concerned. The total number of companies working under the system is fifteen. Although we have considered the main functions of the RCH, there are other activities carried out by the Secretarial Department. The control of the Clearing House rests with the General Section of the Secretarial Department, which, from the inception of the Clearing House, has dealt with the administration of the establishment, staff matters, and the maintenance of premises. Very early, however, in the history of the railways it was found necessary that the companies’ officers should have a common meeting ground, not only for the purpose of dealing with matters affecting the railway companies themselves and the working of the railways, but also for the purpose of considering the multitude of questions which arose between the railways and their patrons the public. Conferences of general managers, goods managers, superintendents, commercial managers, accountants, engineers (civil and mechanical), solicitors, advertising managers, chemists, and other railway officials and their representatives are held periodically at the Clearing House. Practically every description of railway officer has his appointed conference, and the numerous problems which constantly arise in connexion with railway transport are discussed in the board- and meeting-rooms which form part of the accommodation of the department. The work associated with these meetings involves extensive correspondence with the public and the tabulation of voluminous information. Here also the companies from time to time meet representatives of various trade organizations and individual traders to discuss matters of mutual interest affecting the charging and conveyance of traffic over the railways. There is hardly a trade organization in the country or any business house of importance that has not at some time or other had some transaction with the RCH. In one month as many as 180 meetings have been held at the Offices of the Clearing House, involving the attendance of over 1,800 people. The Clearing House is also in touch with the International Union of Railways, which deals with the transport of traffic (passenger and goods) between the various European countries. A particularly interesting part of RCH work is that relating to packing under the Railway Classification Regulations. Before the war, the use of “fibreboard” - or as generally under-stood “cardboard” - cases for railway consignments was uncommon. With the war, timber became scarce and a large field was opened for the use of fibreboard. This caused an increase in the indiscriminate use of fibreboard cases with little attention paid to quality. Thus claims for damage to goods carried by railways in such pack-ages increased rapidly. 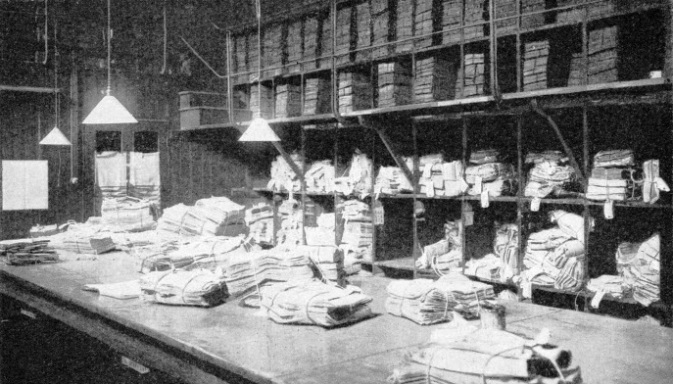 Proposals to regulate the type of packing had to be pressed forward, and in 1916 the Classification Regulations were adopted. Except for slight extensions they are the same to-day. 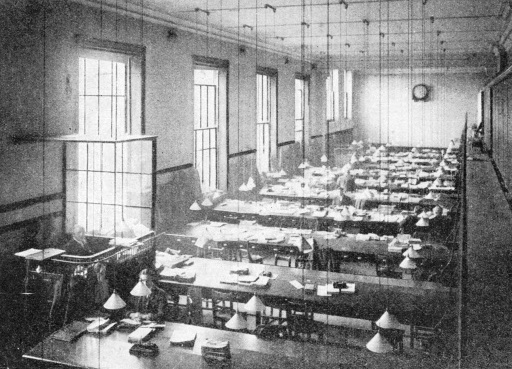 A LARGE OFFICE ROOM in the Clearing House, An idea of the importance of the system may be judged by the fact that in 1842 the receipts of the Clearing House were £193,246, while recently the amount involved in one year was £34,000,000. The regulations provide that - except with brittle or fragile articles - all goods which are carried at company’s risk in wooden cases will also be carried at company's risk when packed in fibreboard cases, provided the packing complies with the regulations. Each package must bear a certificate to the effect that it does comply, and this is a guarantee that the packing is up to classification standard. Brittle and fragile articles are considered on merits, and in practice the approval of fibreboard packages containing such articles is left to the Clearing House, the necessary report being made monthly to the Fibreboard Regulations Committee, who in the main deal with questions of principle. The section of the Clearing House dealing with this work is a real “servicing” department. In response to telephone inquiries, callers, or correspondence, information, advice and decisions are given and packages approved or rejected promptly. If rejected, reasons and, if necessary, demonstrations are given. If it is found that a less costly packing may be used, or that the packing used may be applied more efficiently, the trader concerned is advised. Approximately 160 new packages are dealt with every month; wireless sets, canned goods, medicines, lemon squash, wines and spirit, glass globes, vacuum cleaners, disinfectants - a vast variety of goods comes under examination, and a trader whose package has been passed may rely on the Clearing House not giving his competitor an advantage by approv-ing a lower standard of packing for similar goods. A function of the Secretarial Department is to calculate and record the distances from stations on each company’s line to the junctions with all other companies’ lines. The cost of running the RCH is charged to the companies on an agreed basis. You can read more on “Romance of the Railway Ticket” and “Ticket and Change Machines” on this website, and on “Automatic Coin Machines” in Wonders of World Engineering.